Lea Michele will be diving deep into the ocean this Summer when she helps bring Disney's The Little Mermaid to a live audience. The 32-year-old singer and former Glee star is set to play Ariel alongside Harvey Fierstein, Cheech Marin, and Peter Gallagher at the Hollywood Bowl in LA. According to Broadway World, Michele will swim to the stage for two performances on May 17 and 18 in celebration of the film's 30th anniversary. The venue will also be transformed into a fish bowl-like environment to emulate the underwater feel and create an immersive experience for audience members. Attendees can also look forward to singing along to classic hits such as "Under the Sea," "Kiss the Girl," and "Poor Unfortunate Souls." Oh, and of course, Michele is going to grace everyone with her rendition of "Part of Your World," so bring tissues! It's been an exciting time for Michele, who recently got married to AYR clothing president Zandy Reich. After their wedding, the two went on a romantic tropical honeymoon before making their first public outing as a married couple at the GLAAD Media Awards earlier this week. Considering how in love the newlyweds seem to be, we're guessing Reich will find a way to support his wife come opening night! Denver, CO – Cheech Marin prepares to visit Denver Colorado this week to mark the kick-off celebration of a new partnership with Cannabis One. Cannabis One, a Colorado company, recently joined forces with Cheech in agreement for exclusive rights to produce, market, and distribute a variety of specific cannabis products under the Cheech’s Stash brand. The partnership will allow Cannabis One to continue the expansion of Cheech’s Stash to consumers across U.S.-State legal markets. Besides visiting multiple dispensaries (schedule below) throughout Denver, Cheech will be attending Roosters Magazine’s 2nd annual ‘Kickoff To April party’ to celebrate the best companies, brands, and products in the Colorado cannabis community and will include live music by Afroman and several special appearances. 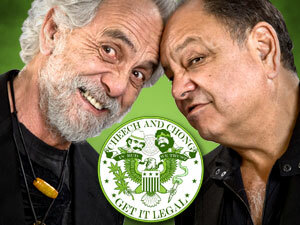 “I’m excited to head out to the forefront of legal weed,” said Cheech. “I am very happy to be joining with the Cannabis One team and am looking forward to a great partnership. I’m thrilled to get our product into the hands of the people of Colorado and soon Oregon and Washington and fulfill our promise that, “IT WILL ALWAYS BE GOOD”. With his daughter Jasmine and son Joey-Dee, Cheech Marin has personally selected strains and worked with master growers to sustainably produce an all natural selection of quality cannabis products, representative of over four decades of legendary experience. Each line offers diverse genetics with a range of Indicas, Sativas, and Hybrids accommodating mid to high THC varieties. These selected strains reflect what Cheech himself considers to be “good weed” and brings to life his unwavering promise that Cheech’s Stash WILL ALWAYS BE GOOD! Cannabis One Holdings Inc. (CSE:CBIS) is focused on aggregating and optimizing popular cannabis brands throughout North America. With its unique, franchise ready retail brand, The JointTM, and through targeted acquisition and partnership opportunities, Cannabis One intends to become the premier, globally-recognized, “House of Brands”, holding a client portfolio of award-winning products with an extensive market footprint. For more information, go to www.cannabisone.life. From cruising down the streets of Los Angeles to racing around the track in North Carolina, Sammy Hagar has quite the itinerary in store for season FOUR of Rock & Roll Road Trip! This season, we’ll travel across the United States to headline festivals, visit iconic musical landmarks, and of course, jam with some of our favorite rock stars. Watch exclusive performances and listen to one-of-a-kind interviews from George Thorogood, Vince Neil, Maynard Keenan, Charlie Daniels and so much more starting with the season PREMIERE May 5th featuring Willie Nelson!